One of my favorite foods in the world is bacon. I briefly toyed with the idea of becoming a vegetarian about a year ago but bacon is one of the things that breaks my will to go meatless. In addition to loving bacon, some of you might know that I have a penchant for unusual ice cream flavors (olive oil, honey lavender, green tea, and basil being some that I've tried already). Before the start of the summer, I had this flash of brilliance for a new ice cream flavor: maple bacon! I kept this idea in the back of my head but never got around to actually trying to come up with a recipe. But then I didn't have to. 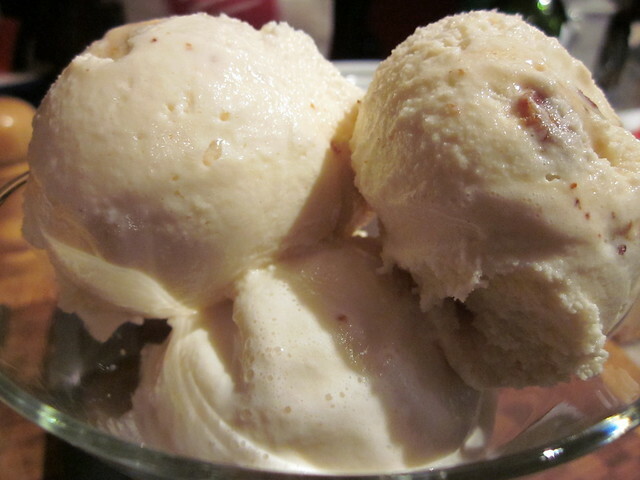 Claire Robinson, that lovely southern belle of 5 Ingredient Fix fame, stole my idea and came up with her own recipe for maple bacon ice cream. 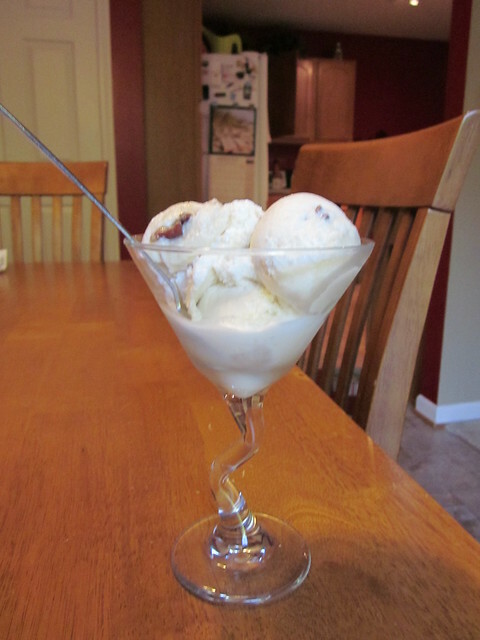 I will forgive Claire for her transgression because she saved me from many egregious mistakes I was bound to make in attempting a feat such as how to incorporate bacon into an ice cream base while still keeping it crispy. I mean, who wants soggy bacon? Certainly not me! So yeah, needless to say, I just used Claire's recipe rather than creating my own and I tell you what, it was AMAZING! Let me take you on my journey of maple bacon ice cream creation. 1. 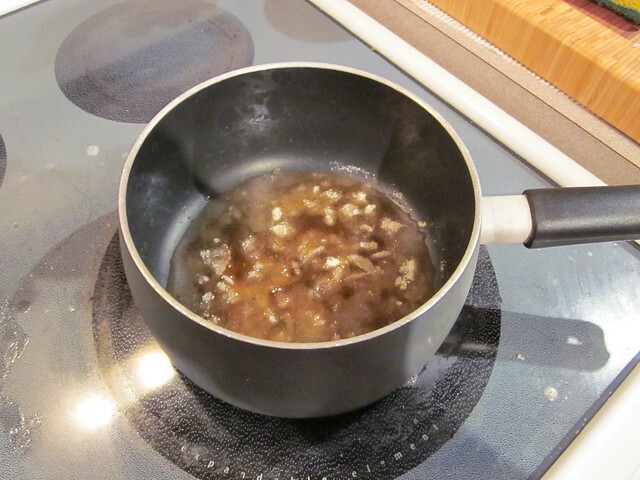 In a small saucepan, over moderate heat, reduce maple syrup by half. 2. In a medium saucepan, over moderate heat, combine half-and-half along with 1/2 cup sugar until hot and just bubbling around the edges. 3. In a medium bowl, whisk egg yolks with 1/2 cup sugar, then add 1 cup hot half-and-half mixture, whisking constantly. 4. Pour whole egg mixture back in saucepan and cook over medium heat, stirring constantly until mixture coats the back of the spoon. 5. Pour mixture through sieve to get rid of any bits of egg yolk that solidified, then whisk in maple syrup. 6. Cover with parchment paper to prevent a skin from forming and then chill in the fridge for at least 6 hours. 8. Line a sheet pan with foil then top it with a baking rack. Place bacon strips on top and bake until crispy (15-20 min). When cool enough to handle, finely chop. 9. Line another sheet pan with parchment paper and set aside. 10. Place the remaining 1/2 cup sugar in a saucepan over medium heat, stirring until sugar starts to melt. 11. 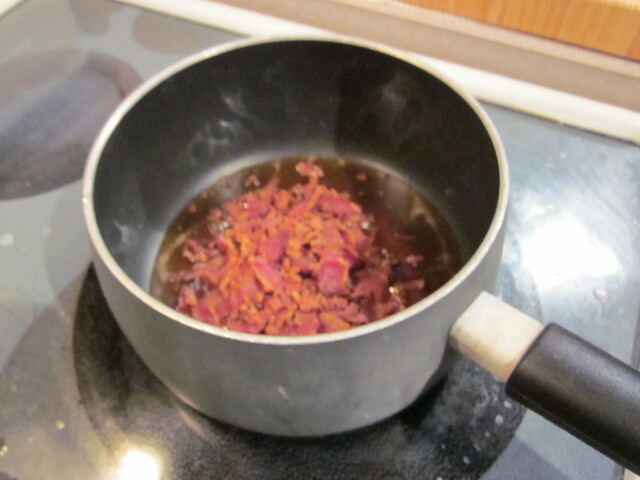 Stop stirring and cook until the sugar is a golden caramel color. 12. Add bacon and stir to coat. 14. 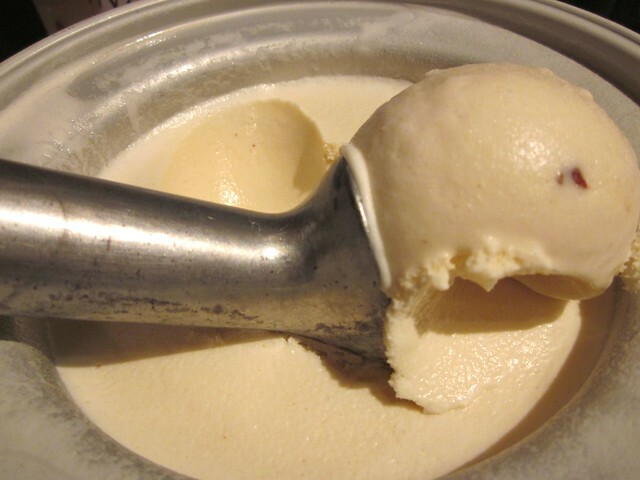 Freeze custard in an ice cream maker according to manufacturer instructions, about 30 minutes. At the last minute, add in the candied bacon and let churn until just combined. Freeze in an airtight container. 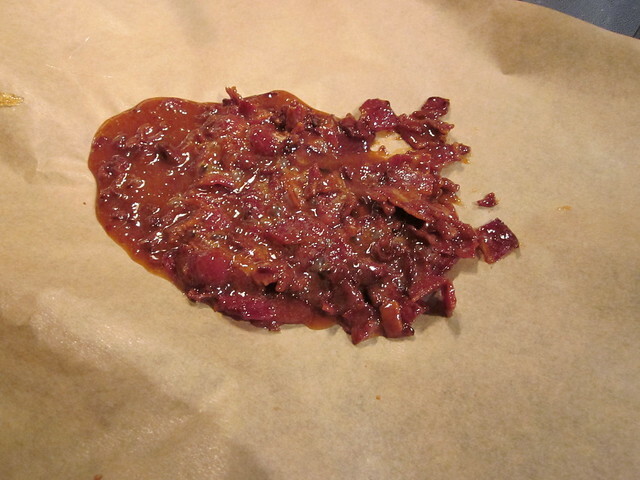 Then behold the maple-bacony goodness upon that first scoop. OMG is right. I may have to give this a try. Ohhhhh. One of my friend's daughters considers herself a vegetarian -- except for bacon -- lol. Have to give her this recipe! I do love bacon, but I am not sure about this one. Who knew such a thing existed?! My dad's favorite meat was bacon. He'd rather have had bacon than anything. My son loves it too, but I'm not sure about bacon ice cream. I'll have to make it for him and see what he thinks! Candied bacon! What a great secret for incorporating into ice cream. I'm not normally into odd ice cream flavors, but if I were at your house, I wouldn't turn down a chance to taste this! I am not a bacon eater, but this sounds like something my daughter would love. 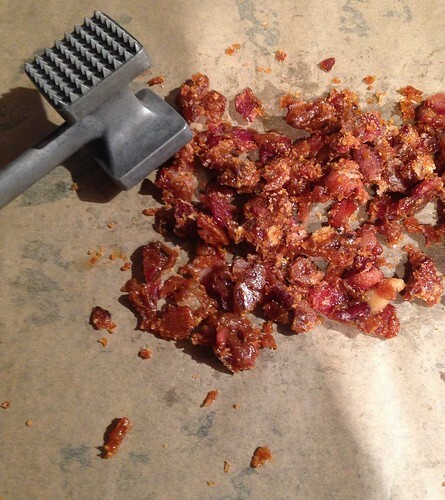 a bacon praline. Not sure I would make it, but I would try it. btw I love green tea ice cream. I think I might try some of your other flavors first...like the lavender or the basil! Oh dear heavens! I had to come and see this maple bacon ice cream. After eating the maple bacon cupcakes, I can see where this would work. Making custard scares me, but I just may give this a try. Candied bacon, what's not to love? Thanks for linking in to Food on Friday. I took the first link out for you.